Tired of feeling like your career has no clear direction? Here’s why. Convinced that the “career ladder” metaphor is too limiting, Facebook COO Sheryl Sandberg offered a new one in her best-sellingbook, Lean In ($14, amazon.com). 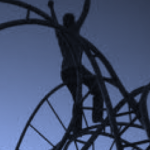 Sandberg argues that we should exchange the “career ladder” for a “career jungle gym.” You can move up or down, on or off the career ladder, but a career jungle gym doesn’t just move in a straight line. On a jungle gym you can move from side to side, across industries, and perhaps onto a new career path. Sandberg says people should think about their careers in terms of the jungle gym model because it offers more choices and flexibility than just reaching for the next rung on the ladder. “The jungle gym model benefits everyone, but especially women who might be starting careers, switching careers, getting blocked by external barriers, or reentering the workforce after taking time off,” Sandberg says. We like to use the phrase ‘career journey’ as that looks more like the reality above and takes into account the elements Sandberg describes in the quote above. A journey is something that includes adventure and discovery as you go along. It is dynamic and implies continued reassessment as it unfolds along the way. It has more elements of risk, adventure and exploration in it. It reflects how new kinds of work and ways of working are being created all the time and result in unpredictability in our career journeys. What does your career journey look like so far? Take a few minutes to draw your career journey so far on a blank piece of paper or a napkin. Do you also recognise elements from the images above in your journey? Has it unfolded over time with one thing leading to the next in a somewhat unpredictable way? This unpredictability and the fact that there is no ‘path’ can lead to feelings like you’re off course or not getting anywhere. 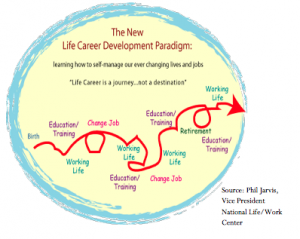 How do you navigate this kind of career journey? Without a direction or focus, a career journey can leave you feeling like you are adrift and not getting anywhere. Thankfully, there are techniques to help you stay ‘on course’ in your career journey and navigate it in a personally meaningful way. Set a career direction, not a career destination. A direction allows you to navigate towards something using your career ‘north star’. This is the kind of navigational tool that helped explorers discover that the world was not flat and kept them from getting lost when crossing oceans and new lands. Keep checking your bearings. Things are not fixed in place. You will need to regularly check your bearings along the way to make sure you are ‘on course’. For us, this means ensuring that your direction is still consistent with your skills, interests, experience, life roles and life stage. If needed, retrace your steps to regain your direction. If you suddenly feel like you’re off course, then don’t be afraid to go back to where you were last on course and learn what you need to shift to regain that sense of being on course. Norm Amundson speaks of this as the career backswing – the backward swing of the racket or club is what provides the momentum and energy to send the ball (your career in this case), taking into account the wind and weather at the time, flying in the direction you want when it’s struck by the racket or club. Life Coach Martha Beck, talks about retracing your ‘tracks’ to the last place you felt like you were on course and picking up the scent of your trail again from there. Each of these three techniques use specific skills and tools that together create possibility and opportunity as well as open your eyes up to unanticipated opportunities for your career. We outline the first of these key skills in our complimentary online course, Find Your North Star. It will support you to identify your own personally meaningful north star to help keep you on course in your career journey. Career in Your Suitcase coaching and programs provide you with the insights and skills you need to be able to set your career direction and navigate your career journey regardless of the uncharted territory you find yourself in. You can get a taste of our approach in our 30 minute webinar What’s Next for Your Career?